All roulette players understand the fact roulette is a game of luck and chance but nevertheless they do not give up the attempts to increase their chances for winning. One of the methods to do that is biased wheel: a lot of gamblers tried that technique and some of them were successful with that though it was not considered to be perfect. Gonzalo Garcia-Pelayo, a Spanish mathematician and record producer was able to make a biased wheel to work on him. His winnings are counted by millions and casinos are not able to prove the fact of cheating; actually, it is not clear whether cheating has a place here. Frankly speaking, Gonzalo Garcia-Pelayo had never been a very successful record producer but a very passionate roulette player. He believed that a roulette wheel could not be completely perfect and it was possible to find some bias to increase chances for winning. He began to analyze different roulette wheels in the casinos of Madrid and record all the results. 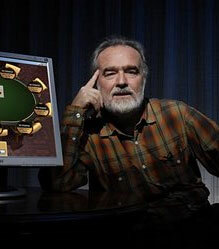 Gonzalo had found that some numbers of one roulette wheel were more likely to win than others and he decided to use this fact in order to increase a player edge. He went to Casino de Madrid and won 600 euro per night! In general, Gonzalo Garcia-Pelayo was able to win 1 million euro in that casino! He had a chance to turn a house edge of 5% into a player edge of 15%. Casino de Madrid tried to get money back and it began to do that through the court where tried to prove the fact Gonzalo Garcia-Pelayo cheated when he played roulette. But the court was in favor of Gonzalo telling that it was the casino itself which should worry about its fixed roulette wheels. As a result, they were not able to prove anything and ban him. Interesting fact is that this litigation had ended only in 2004 (!) though started at the beginning of 1990s. This story about Gonzalo Garcia-Pelayo's success at roulette game became widely known, and casinos became to be rather suspicious concerning him and his family. Well, anyway, 2 million euro of winning at roulette is quite enough in order not to worry about this, how do you think? If compare with The Eudaemons, Gonzalo is very successful roulette player for sure!